Vincent Barret, Dorset Enterprises, London. J. Rewald, Renoir Drawings, New York, 1946, no. 12 (illustrated). C. Renoir, Seize aquarelles et sanguines de Renoir, Paris, 1948, no. 11. R. Cogniat, Renoir: Enfants, Paris, 1958, p. 5 (illustrated). F. Daulte, "Renoir dessinateur et aquarelliste," l'Oeil, May 1985, no. 358, p. 62 (illustrated in color). Paris, Les Expositions des Beaux-Arts et de la Gazette des Beaux-Arts, June 1954, no. 90. Paris, Expositions Quatre Chemins, November 1956. Paris, Galerie Hopkins-Thomas, Exposition Renoir: dessins et aquarelles, April-June 1985, no. 12 (illustrated in color). Laren, Singer Museum, De Impressionistische wereld van Julie Manet, May 1990. In the latter half of the 1880s Renoir spent longer periods of time in the countryside, taking his mistress Aline Charigot and their new son Pierre away from the bustle of Paris. In 1888, during a three month visit to Aline's home village of Essoyes in Champagne, he began his first important paintings of peasant life. He wrote to Berthe Morisot and Eugne Manet, "I'm playing peasant in Champagne in order to escape the expensive models of Paris... I'm becoming more and more of a rustic" (quoted in D. Rouart, Correspondance de Berthe Morisot, Paris, 1950, p. 142). Renoir relished the opportunity to paint casually posed figures in a natural, rural setting as a welcome relief from the more formal portrait commissions and scenes from urban life that occupied him in his Paris studio. Indeed, he adopted a freer manner in his brushwork, and a warmer, more pastel-like palette. However, he never divested himself of the more glamorous aspect of his art, and never sacrificed beauty to naturalism. "[Renoir's] gentle, almost idyllic vision of country life bears comparison with the more monumental, solemn images of work which Pissarro was painting at the same time; Pissarro's concerns were with the roles of laborer within an integrated rural society, Renoir's... with the country as site for easy relations and healthy occupations" (J. House, Renoir, exh. cat. Museum of Fine Arts, Boston, 1985, pp. 253-254). 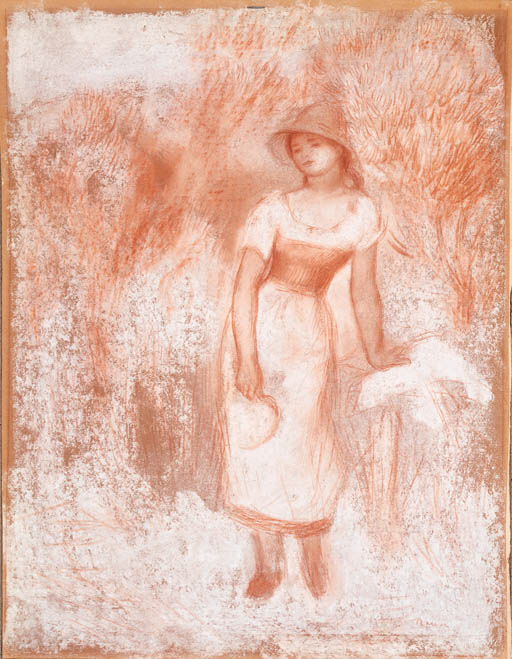 Even though the young girl in the present pastel study carries a small scythe as a reminder of her work, she seems dressed too prettily for real labor in the fields, and has perhaps posed in her Sunday best. (For two related drawings, cf. A. Vollard, Pierre-Auguste Renoir: Tableaux, Pastels et Dessins, Paris, 1918, vol. II, pl. 88). Indeed, this is the charm of Renoir's rural manner; such images convey an idealization of femininity even in the context of the rigors of farm life, and project a classically derived idyllic serenity that becomes a key aspect of his late and most influential style. Please note that the correct title for this lot is Femme debout la faucille (La moissonneuse). Please note the first line of provenance should read: Galerie Bernheim-Jeune, Paris. Also please note that the 1985 Galerie Hopkins-Thomas exhibition, Exposition Renoir: dessins et aquarelles, also traveled to Artis, Monte Carlo in July-September of that year.